I got my first Aqua-Bound paddles in 1998. They were a part of one of the nicest and most generous gifts I have ever received. All through the previous year I had been looking at open double kayaks that Lisa and I could paddle together, or that I could paddle solo when I wanted to. 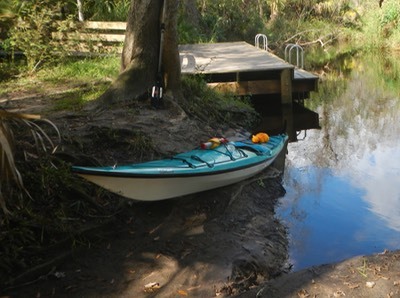 After paddling several different boats, I had settled on a Wilderness Systems Pimlico 16. But I just didn't feel like I could spend the money on something like a kayak when we needed so many other things for our new home. 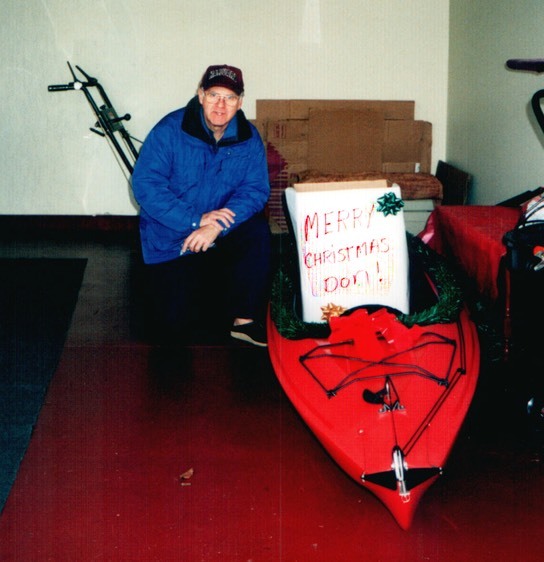 On Christmas Day 1998 I opened a small box with a garage door opener in it. I was excited and totally perplexed as I followed written instructions to go out in the driveway and press the button. When I did, our neighbor Helen's garage door began to slowly lift, exposing a red Pimlico. I was totally gassed! I just couldn't figure out how she had purchased the boat and gotten it home without my having a clue (I have been told from time to time that I am clueless. Maybe it's true). Now here's where the paddles come in. 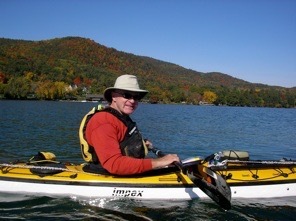 With the boat were two new Aqua-Bound 220 cm low angle paddles. I loved them - until I found out how much they had cost, about $200.00 each! The explanation for the purchase of these paddles as given to Lisa by the salesman went like this. Your paddles are your power. If your paddles are too heavy you will become easily fatigued. So it makes sense to buy the lightest paddles you can afford. That's advice I have followed ever since, with one additional caveat. 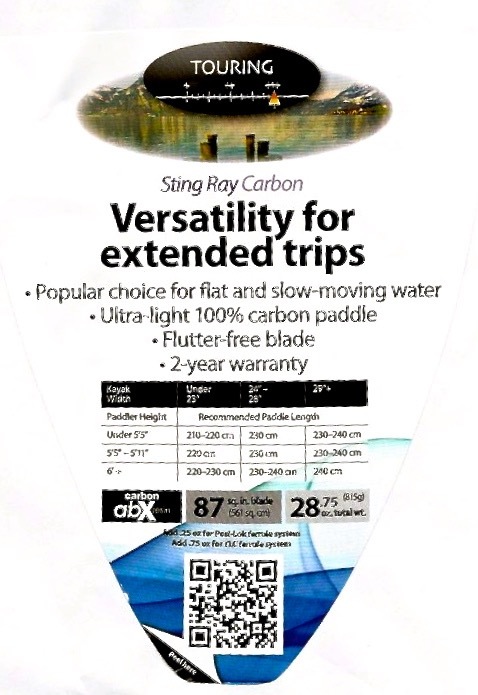 The paddle should be light weight and durable but not cost so much that you are afraid of damaging it. These Aqua-Bound paddles fill the bill. I am now on my third generation of these paddles. The blades and shafts on all three generations are the same. The improvements have come in the design of the ferrule or locking mechanism. The first generation paddle had only feathered or unfeathered blade positions. This was pretty typical of paddle design at the time. But things began to change quickly. The second generation paddle had a system that let you set blade angles from zero to sixty degrees. You pushed the paddle ends together until teeth on the ferrule meshed at the setting you wanted. Then you turned a ring that encircled the connection to lock it in place. The only problem with this system was that it sometimes locked up and became difficult to take apart. At other times, the locking ring would loosen and need to be retightened. It wasn't a big problem, but it was an annoyance. The third generation paddle has a system called Posi-Lok that allows for fifteen degree adjustments also. The difference is in the locking mechanism. On this paddle you line up the marks to set the paddle angle, then just slide the two halves together till you hear a click. When it clicks, the blades have locked in place. Press buttons on each side of the paddle and the blades easily slide apart. Sweet! The paddle weighs 28.75 ounces. I use a 220 cm length with a low angle paddling blade. This is not a power blade but is good for touring and covering distances. (I also have a high angle blade that I keep on deck as a back-up.) I bought mine from OutDoor Play (www.outdoorplay.com). If you join as a member you receive 15% off of all their products plus free shipping and no tax. These blades sell for around $200.00. I paid around $160.00 for mine. When Lisa was testing the boat I eventually bought her, the salesman put an ultra light weight Werner bent shaft paddle in her hands. After falling in love with the boat (an Impex Montauk) I agreed to buy it for her. As an after thought Lisa asked, "Can I have this paddle too?" How could I say no? However, I never asked the price - over $400.00. I bought several cars over the years that didn't cost much more than that! Lisa used the Werner paddle for quite a few years. Then, for reasons lost in time, she asked to borrow my Aqua-Bound. She loved it. Said it was easier to use and more comfortable than her Werner. 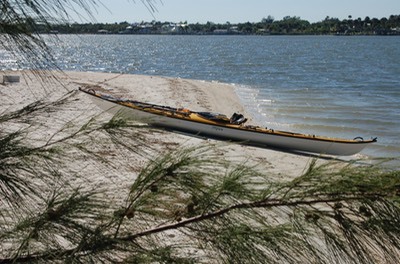 Not long after, I lost my paddle by leaving it behind at a launch point. So when she said I should sell her Werner, I put it on eBay and got $300.00 for it, almost enough to buy the two Aqua-Bounds I replaced it with One for Lisa and one for me). I have never found bent shaft paddles to be comfortable. I have arthritis in my right hand that a bent shaft aggravates in ways a straight shift does not. I feel that the bent shaft locks my hands into a fixed position, making it difficult if not impossible to move my hands to other positions on the shaft. With a straight shaft I can make the shaft length longer or shorter on a given side of the boat to enhance a sweep stroke for instance or counter a quartering sea, or just change hand positions when paddling for hours. These reasons are not a specific endorsement for the Aqua-Bound paddle. However, I have found that my Aqua-Bound paddles fill the bill in terms of comfort, durability and cost. Everyone has their opinion about paddles: Euro Paddle or Greenland Paddle; straight shaft or bent shaft; feathered or unfeathered. There is no right or wrong position on any of these choices. What you choose is a matter of preference, training and personal history, as is the brand of paddle you like. I happen to like these Aqua-Bound Paddled very much. I like them well enough to have bought a half dozen of them over time. They are high quality, light weight but sturdy and have a great cost to benefit ratio. And if I break one, it's $160.00 to replace it, not $400.00. And maybe best of all, Aqua-Bound Paddles are made in America! FYI, Yackman is not affiliated with Aqua-Bound Paddles or OutdoorPlay in any way. I happen to like and use these products. Check them out. You might like them too. Happy New Year! I concur with your recommendation on the Aqua Bound Stingrays. I bought a set as a spare because of the price. One day I finally decided to use them and realized they're a great low angle touring paddle. You would have difficulty beating this value proposition.